We’d love your help. 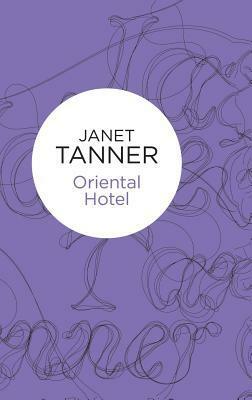 Let us know what’s wrong with this preview of Oriental Hotel by Janet Tanner. Just the mention of his name... and for Elise Sanderson the years simply rolled away, bearing her back on a sea of bittersweet memories to those heady, dangerous days before the flames of war had ravaged the East. Then, in the golden days of her youth, she had swept through the doors of the Orient's great hotels, into a world where bell-boys ran to answer every whim, where Just the mention of his name... and for Elise Sanderson the years simply rolled away, bearing her back on a sea of bittersweet memories to those heady, dangerous days before the flames of war had ravaged the East. Then, in the golden days of her youth, she had swept through the doors of the Orient's great hotels, into a world where bell-boys ran to answer every whim, where the champagne was permanently on ice, where elegant men in tails and women in exclusive haute couture danced to the endless music of orchestras. It was then, she recalled that she had first seen him, lounging languidly in a rattan chair, already in uniform, cigarette smoke curling lazily around half-closed hazel eyes. It was a dangerous face, she had thought in that first startled moment. A face to be reckoned with . . .
To ask other readers questions about Oriental Hotel, please sign up. Originally published in 1984, this definitely has the feel of books written in the 70s and 80s. I got this book from Open Library because forbidden love combined with war time setting is my kind of catnip and used copies of this book--at least here in the US--sell for a crazy price. Unfortunately, the downloadable format is not available, so it's restricted to online reading. This story is an epic love affair between Elise Sanderson (married to Gordon Sanderson, a businessman running several electronics factories based in Hong Kong) and Gerald 'Brit' Brittain, an RAF pilot invalided after being wounded in a plane crash but secretly reassigned to intelligence for a mission to report on what's happening in China. Brit is the black sheep son of the tai-pan of Cormorant, a powerful family business empire that's been in Hong Kong for many generations. The story covers two time periods: the early 40s leading up to the invasion of Hong Kong, which takes up 3/4 of the book when Elise is in her 20s, and 1983 when Elise is in her 60s. The love affair is really the main focus of the novel with the war secondary but furthering the plot. I'm going to put the rest of my comments in spoilers because (a) it's hard to talk about the present-day thread without revealing spoilers for the past-day thread and (b) I actively seek out older books to read and many of them don't have much written about them, so I personally find it helpful when reviewers actually go into detail about the stuff that happens. It helps me determine whether it's worth my time to read. I hope the spoilers will be helpful for others who are looking for that kind of detail. However, I stress again, if you don't want to know what happens, don't read the spoiler section. Elise traveled on her own to Cairo to see her dying mother, leaving behind her husband (who is twice her age) and a five-year old son in Hong Kong. After her mother's death, she's anxious to return to her husband and son. It's 1940 and she's been pleading with anyone of influence to help her get passage back to Hong Kong. She meets Brit in Cairo who is also traveling to Hong Kong, and he helps her get passage on the same troop transport ship as himself. Due to the war, and particularly the threat of U-boats, the British were only allowing those essential to the war effort to book passage. "She had stayed in so many of the great hotels on that voyage with Brit -- Shepheard's in Cairo, the Taj Mahal in Bombay, the E&O in Penang, and Raffles in Singapore -- but it all seemed a little like a dream now. So long ago, so very long ago. . ."
Brit wants Elise to leave her husband, and later when their affair is outed, her husband threatens to cut her off from her child. It's Brit or her child, she can't have both. In the meantime, Brit goes to China on his mission and Elise discovers she's pregnant with his child. On the very day she is making preparations to leave Hong Kong, the Japanese invade. Brit returns just in time and dies helping Elise, now nine months pregnant, and her son escape. Off page (we get a summary explaining in just a few sentences what happens) Elise's husband is captured and held as a POW during the war years. Elise reconciles with Gordon after the war, and they go on to lead a prosperous life in England where they build another electronics business together, but Brit will always be the love of Elise's life. She didn't make contact with Brit's family and no one in his family tried to contact Elise, so it's assumed no one in Brit's family knew about their connection or that Brit had a daughter. Interestingly enough, the love child doesn't enter directly into the present day plot. Geraldine, the daughter, doesn't know about her paternity and is happily oblivious and mostly off page and undeveloped. In the present day thread, the day-to-day operations of the Sanderson business is run by Elise's son and son-in-law who took over after Gordon died (Elise has been a widow for 10 years). Due to cash flow issues, they are considering a business deal with a German entrepreneur. Elise's grand-daughter, Katy, has been dating the entrepreneur to help seal the deal and please her father. Elise is especially close to Katy, who is in actuality Brit's grand-daughter. Elise worries that Katy will be repeating her own mistakes if she marries a much older man that she does not love. Elise is determined to prevent this from happening. In the meantime, Stuart Brittain, the grandchild of Brit's brother who is the current tai-pan of Cormorant, travels to England on business but seeks out Elise to return a locket he found with his great-uncle's personal effects. Elise shares some of her personal story with him, and Stuart is able to guess the rest. He invites Elise and Katy to return to Hong Kong with him. While there Elise visits Brit's grave. The gravestone shows Brit's age as 24, which surprised me, and sheds a different light on his characterization. In all honesty, I don't know whether that's good or bad--maybe a little of both. I expected him to be at least several years older rather than around the same age as Elise. Janet Tanner is a prolific and well-loved author and has twice been shortlisted for RNA awards. Many of her novels are multi-generational sagas, and some – in particular the Hillsbridge Quartet – are based on her own working class background in a Somerset mining community. More recently, she has been writing historical and well-received gothic novels for Severn House – a reviewer for Booklist, a t Janet Tanner is a prolific and well-loved author and has twice been shortlisted for RNA awards. Many of her novels are multi-generational sagas, and some – in particular the Hillsbridge Quartet – are based on her own working class background in a Somerset mining community. More recently, she has been writing historical and well-received gothic novels for Severn House – a reviewer for Booklist, a trade publication in the United States, calls her “a master of the Gothic genre.” Besides publication in the UK and US, Janet’s books have also been translated into dozens of languages and published all over the world. Before turning to novels she was a prolific writer of short stories and serials, with hundreds of stories appearing in various magazines and publications worldwide. Janet Tanner lives in Radstock, Somerset.